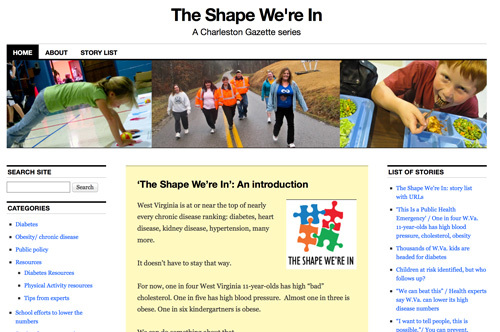 “The Shape We’re In” is a national award-wining Charleston Gazette series on West Virginia’s high obesity and chronic disease rates, written in 2012-13 by Kate Long. The series spotlights the high cost of the state’s poor health situation, combined with inspiring stories about West Virginians who are trying to – and showing us how to – to lower those numbers, community by community. The series is a great resource for people who want to get a grip on West Virginia’s situation and for people who want ideas about what they might do in their own communities. The Web site has also been set up as a classroom resource. Students, instructors and researchers will find in-depth information, practical advice and dozens of personal stories that can be used to enrich studies of prevention of chronic disease. Here is a link to the entire series, including 70 stories, photographs, videos, charts and resource lists.